Patea is the third largest town in the province of South Taranaki. The Patea River flows through the town from the north-east and into the South Taranaki Bight. In the 2013 census, the population was 1,098 people, in 1961 there were 1,991 people living in the town. When the first Europeans arrived the principal Maori villages were across the river at Hukatere, Otautu, Tihoi and Wai-O-Turi and north of Patea at Whitikau, Kakaramea (invaded in mid 1860's and became Cameron's Redoubt), Otoia - inland of Kakaramea, Manawapou at Manutahi Beach and another large settlement at Whakamara. The missionaries; William Hough, and then Thomas Skinner were stationed at Patea from 1844 to 1848, but there was no other European settlement until the mid 1860's when the British Troops made Patea their base between New Plymouth and Wanganui. Ngati Ruanui assisted the Northern Tribes when the Land Wars started in the early 1860's and were declared rebels in 1864 when they refused to lay down their arms. The Land Wars soon moved to South Taranaki and continued until 1869, the final battle at Otautu in March 1869. By the 1870's the present town site was surveyed and named Carlyle. The Taranaki Provincial Council paid a salary to the Patea River Ferry Keeper (Alfred Wood), but did little else for the town. European Settlement resumed under the care of a Resident Magistrate, James Booth, appointed by the Central Govenment, and in March 1870 town sections were auctioned. The proceeds of the sale were to pay for streets, a wharf and other improvements. On 8 May 1872, the Taranaki Provincial Council resolved "That the portion of the Patea District known as the Town of Carlyle, situated on the west bank of the Patea River...bounded towards the north by Stafford and Durham Streets, towards the east by the Patea River, towards the south by Essex Street, towards the south-west by Taranaki Road and towards the west by Devon Street be proclaimed a Town..." After a determined effort by town leaders, finally in 1873 Patea was allowed two representitaves on the Taranaki Provincial Council; Felix McGuire and Hector Stephen Peacock. 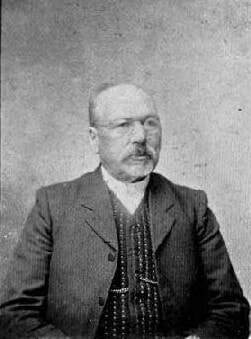 George Francis Sherwood became the third Patea representitive in 1874. 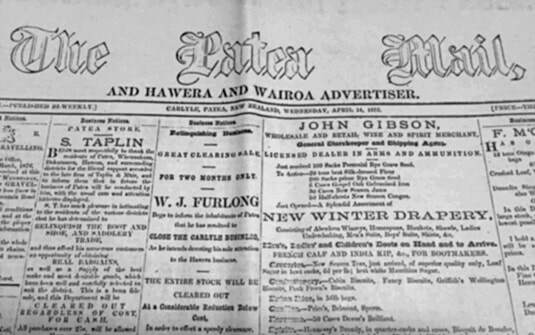 As Patea developed into a commercial, industrial and administrative centre, demands for some better form of control arose and on 27 March 1874, 37 Carlyle residents petitioned the Taranaki Provincial Council for the establishment of a Town Board. This was granted and at a meeting on 23 August 1875 the following 7 men were elected members of the inaugeral 'Carlyle Town Board': Messrs George F Sherwood (Chairman) John Milroy, William Williams, Felix O'S McCarthy, James Southby, James Rhodes, Samuel Taplin. Roading construction through the newly cleared land was a pressing issue and on 26 July 1875 the 'Patea West Road Board' elected its first committee of: Edwin R Morgan (Chairman), George William Gane, Richard England McRae, Peter Wilson, Andrew Hunter, Edmund M Honeyfield, James D F Christie, James Southby, Hector S Peacock. 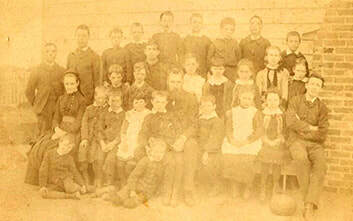 In 1876 the Provincial Councils were abolished and on the 18 December 1876 the first Patea County Council was elected: Messrs George F Sherwood (Chairman), Hector S Peacock, Henry Williamson, Andrew Hunter, Samuel Taplin, William Dale jnr, Edwin R Morgan, Edmund M Honeyfield. 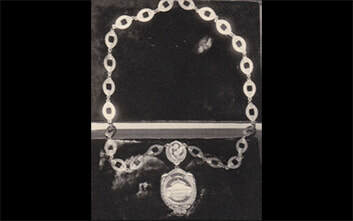 (the district was known as 'Otoia Riding' included Carlyle, Whenuakura, Kakaramea and Manutahi). In March 1877 The Patea Harbour Board was formed, the first committee comprised of several familliar names: George F Sherwood (Chairman), Charles Allen Wray, Henry Williamson, W Wilson, John Milroy, William Williams, Edwin R Morgan. 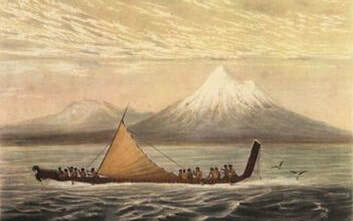 At this time Patea's population had almost reached 650. By 1881 the town had virtually reached its peak as the chief town, port and industrial centre of Taranaki. The achievement of Borough status sealed the towns success. The name 'Carlyle' had never really been fully accepted and the Borough adopted the name 'Patea'. The Patea Borough Council was gazetted on 10 October 1881 (and operated until the South Taranaki District Council was formed in 1989). 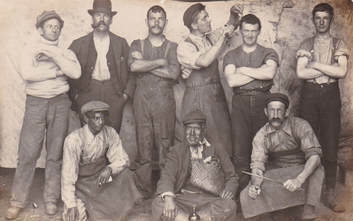 The Carlyle Town Board of 7 members ceased to exist and a new Mayor and committee of 10 Borough Councillors was elected: George F Sherwood (Mayor) Samuel Taplin, John Milroy, Patrick Mahony, Robert Albert Adams, William Aitchinson, William Dixon, Patrick Mahony, John Gibson, William Howitt, Alexander Black. None of these men received any remuneration for their services to the Council, infact almost 80 years were to pass before a salary was given to Council members. 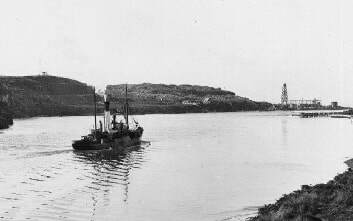 The Patea Steam Shipping Company was also formed in 1878. The Company’s first steamer was the 79 ton, 83 feet long, steamer ‘Patea’ which arrived in Patea in February 1879, and served the township for many years. ‘Patea’ carried 20 passengers and offered them an overnight service to Wellington, returning the next evening. Her arrivals & departures were always treated as occasions by the settlers. Special Christmas excursions to the Marlborough Sounds were advertised at £4 a ticket. It also owned 'Waverley' and 'Whakatu', before it wound up in 1886. The South Taranaki Shipping Company was formed in 1912, by the West Coast Refridgeration Company and several sunscribing local Dairy Companies to export their Cheese and Butter. Its fleet of its first four vessels were: 'Hawera', 'Kapuni', 'Mana' and 'Kiripaka'. Other ships followed, until the Port closed in 1959. In August 1883 what was to become a major industry in Patea for almost a century, the Freezing Works, began production as a Canning Factory. 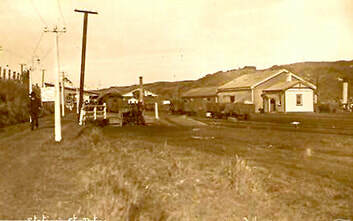 The Patea Dairy Factory opened in 1894, in the same area as The Works. 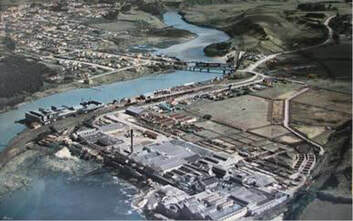 The Patea Chamber of Commerce was foundered in 1885, but was stagnant until 1897, when it undertook the lead in having a Dairy Grading Works set up beside the River. The key to this was the Port which was improved by the stablising of the entrance channel. The West Coast Refridgeration Company (The Cool Stores) was begun in 1901 as a co-operative concern owned by subscribing Dairy Companies throughout South Taranaki. Patea was one of the first towns to get electricity in April, 1901. The power-house was situated about 3km north of the town at the end of Powerhouse Road. Water was derived from the Kaikura Stream on the Honeyfield farm, and a dam of about eight acres in extent was been constructed to conserve the supply. There is a good fall, which drove a Brown-Bouverie alternator, 300 volt, 50-cycle generator. The current was led into the town, where it is transformed at various places to 100 volts. Electricity was supplied on three systems; namely, contract, assessment, and metre. In 1906 there were 100 consumers of electricity. A new Town Hall was built in 1912. 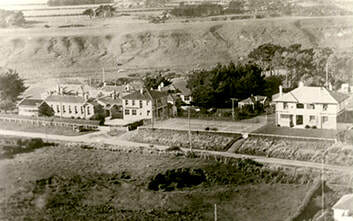 There were 28 two storey buildings in Patea by this time, and it had had 10 Hotels open its doors over the years. 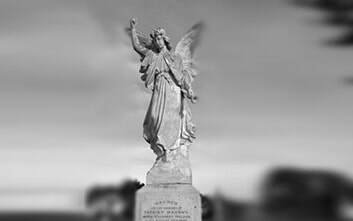 WWI took away a generation of Patea men for the years leading up to the 1920's, returning most, but not all of them. 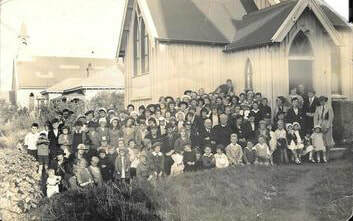 The early 1930's bought the hard years of economic depression, but a generous bequeath from Hunter Shaw gave the town a new Library & Plunket Rooms, as well as the Childrens Ward at the Patea Hospital. The monumental Turi's 'Aotea Waka' statue was unvielled on 2 August 1933, and the new Patea Court House was opened that same year. Many other important parts of our town, and numerous people have come and gone ....leaving memories, stories, fragments of a time of innovation, risk, prosperity and recession. Keeping the stories alive is vital, it reminds us where we have come from, and ensures that we don't forget the fascinating history that happened on the ground we walk on every day.